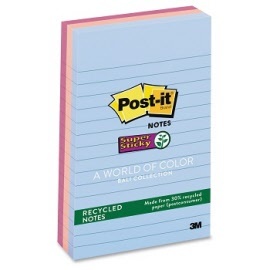 Keep your notes straight with these - the original rules with lines! 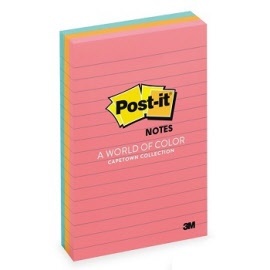 The most popular size Post-it® Notes in the perfect size for everyone. 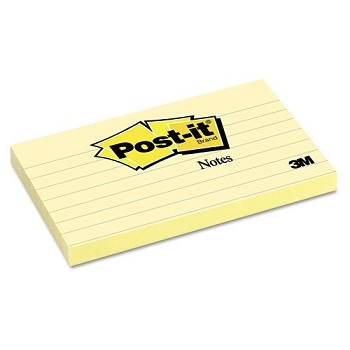 Canary Yellow original lined self-stick, repositionable, touch down adhesive notes. All Post-it® Notes are recyclable. Keep your thoughts straight on these Post-it® Notes with lines in our most popular size. Neon Colours original lined self-stick, repositionable, touch down adhesive notes. Economical 6 pack contains an assortment of colours from the Cape Town collection. Cape Town Collection (formerly 'Neon Colours') original lined self-stick, repositionable, touch down adhesive notes. 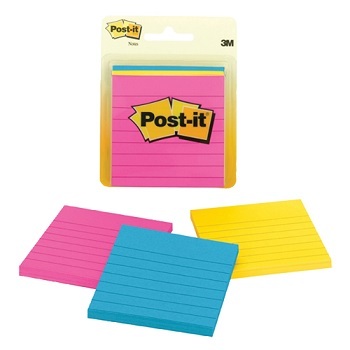 These Post-it® Notes in index-card size are great for to-do lists. 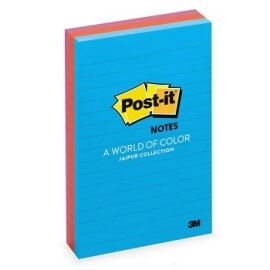 Keep your thoughts straight on these Jaipur coloured lined Post-it® Notes. The pack contains an assortment of colours from the Jaipur collection. Jaipur Collection (formally 'Ultra Colours') original lined self-stick, repositionable, touch down adhesive notes. The pack contains an assortment of colours from the Cape Town collection. 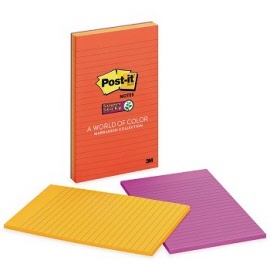 Extra large square pads for bigger impact! 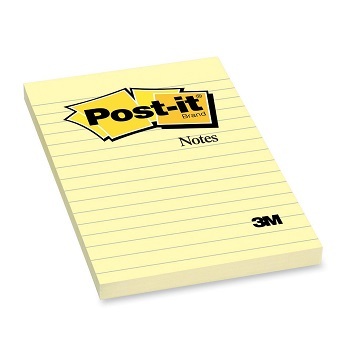 More space for your notes and reminders and pad will not get lost amongst desk clutter. 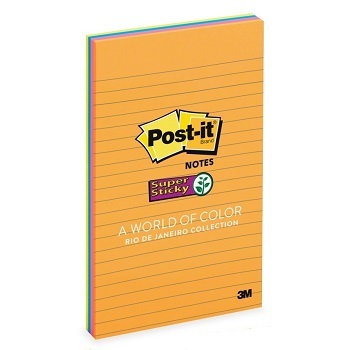 Canary Yellow original lined self stick, repositionable, touch down adhesive notes. Get your message straight and really stand out... stick practically anywhere! 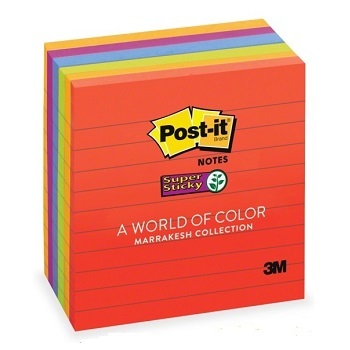 Marrakesh Collection (formerly 'Neon Colours') super sticky lined, repositionable, touch down adhesive notes. Paper used comes from well-managed forests where trees are replanted. 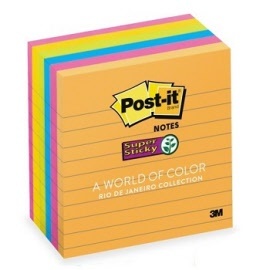 Rio de Janeiro Collection (formerly 'Ultra Colours') super sticky lined, repositionable, touch down adhesive notes. 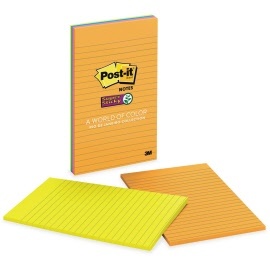 Perfect for longer messages, memos, check lists and more. Got a lot to say? Get the message straight on these colourful exciting Jaipur notes with lines. Convenient three-pack of assorted Jaipur collection colours. 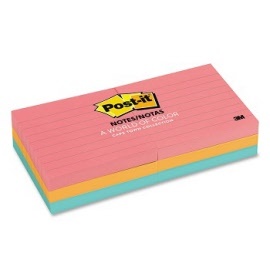 Jaipur Collection (formerly 'Ultra Colours') original lined self-stick, repositionable, touch down adhesive notes. Got a lot to say? 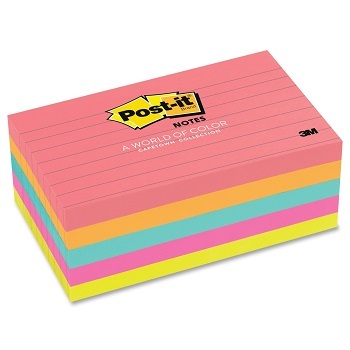 Get the message straight on these neon glow notes with lines. Convenient three-pack of assorted Cape Town collection colours. Got a lot to say? 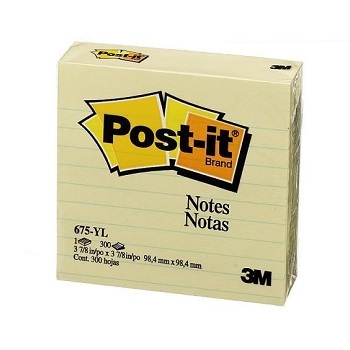 Get the message straight on these natural fresh notes with lines. Convenient three-pack of assorted Bali Collection colours. Bali Collection (formerly 'Natural Colours') super sticky lined, repositionable, touch down adhesive notes. Recycled. Made from 30% recycled paper (post consumer) to support a better future. Post-it® Super Sticky Meeting Notes ideal for use in meetings and other group activities such as brainstorming and conference sessions. Bright neon colours enhance marker contrast for increased visibility in group situations. 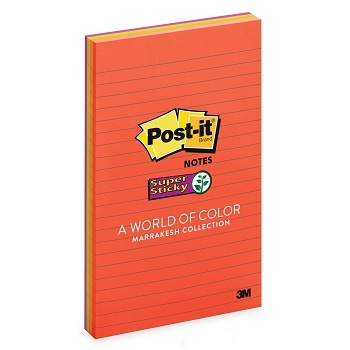 Bright ultra colours enhance marker contrast for increased visibility in group situations. 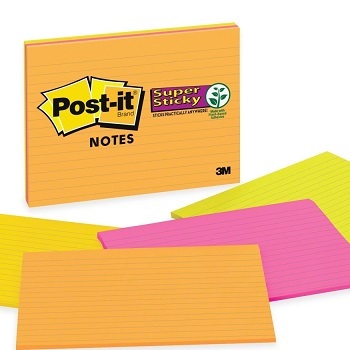 Extra large Post-it® Super Sticky Meeting Notes ideal to turn your meeting walls into idea generators. 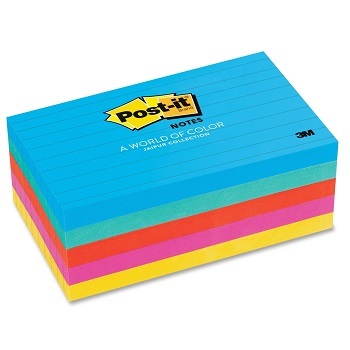 Rio de Janeiro Collection (formerly 'Bright Colours') super sticky lined, repositionable, touch down adhesive notes. Bright colours enhance marker contrast for increased visibility in group situations.